Our first Haskap berry seedlings were planted in 2008 and we currently have 1000 Haskaps, of which 700 will be in production for 2014. 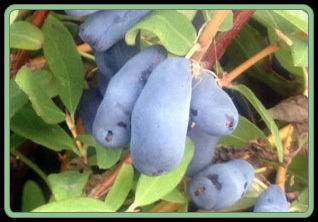 It is also known as “Blue Honeysuckle, Honeyberry, Edible Honeysuckle and Sweetberry honeysuckles.” Most people mistakenly group haskap as a new type of blueberry but haskap’s closest fruit relation is the tomatoe. 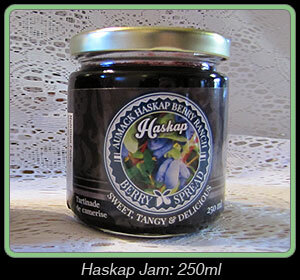 Haskap fruit production is a new and developing industry in Canada. The original varieties of these fruits released to the Canadian fruit industry produced quite a small bitter fruit. The new varieties that are being developed from the U of S are being branded as ‘Haskap’ because our Japanese cooperators considered them to be of high enough quality to be used in the Japanese market. 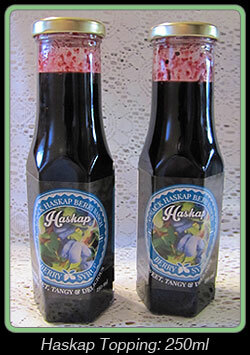 No other fruit is like a haskap. They have such a unique flavour, color and texture. Most people describe the flavour as sweet with a tangy kick. The skin melts in your mouth and the seeds are not noticeable. The color of the juice is a decadent navy blue. The blooms can withstand -8 degrees of frost and the fruit rippens about the same time as strawberries. The fruit has a sweet tangy zing flavour that most people say is a cross between a blueberry, raspberry and black currant. The berries have extreme high levels of antioxidants – even higher than blueberries. Because of its nutritional value, the Haskap berry has long been known by the ancient Japanese as ‘the fruit of Life longevity and Fruit of vision’. It is a fruit that holds a high nutritional value and tastes wonderfully sweet. We are currently making jam and topping which can be used on pancakes, waffles, crepes and sundaes. The fruit is a heavenly match with any type of dairy product. The berries can be used in muffins, crisps and smoothies. Please phone or email if you would like to try some. We are also looking into making other products from this tasty berry in the near future. 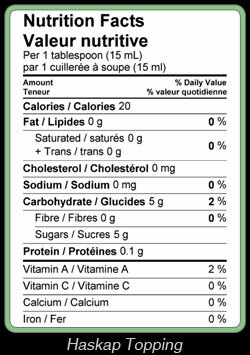 Haskap berries, sugar, pectin, lemon juice concentrate, fumaric acid, sodium benzoate, sodium bisulfite and lemon oil. 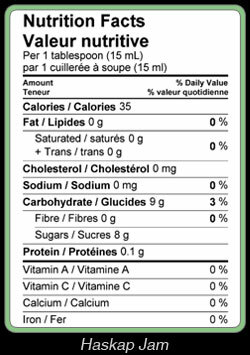 Haskap berries, sugar, water, lemon juice concentrate, sodium benzoate, sodium bisulfite and lemon oil.